From authentic taquerias to fine-dining Mexican cuisine and even taco trucks dishing out burritos on four wheels, there&apos;s no shortage of choices for south of the border fare. 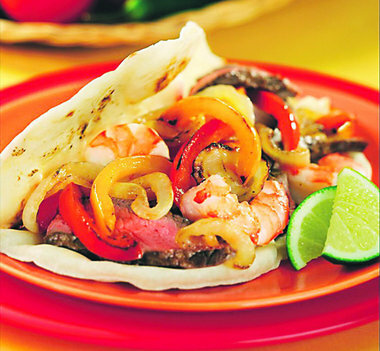 Courtesy photoGrilled Fajita Steak and Shrimp Tacos.In the state of Puebla, Cinco de Mayo officially commemorates the underdog victory of the Mexican army over French forces in 1862. But in Metro Detroit, May 5 has a decidedly cultural — and gastronomic — appeal. And it’s a holiday that Mexican food fans of every stripe can celebrate. This Saturday, restaurant owners all over Metro Detroit will be frying tortillas and pouring gallons of tequila in celebration of the Cinco de Mayo holiday. From authentic taquerias to fine-dining Mexican cuisine and even taco trucks dishing out burritos on four wheels, there’s no shortage of choices for south of the border fare. We (reluctantly) skipped the Taco Bell Fourth Meal menu to bring you our picks for Metro Detroit’s best Mexican fare. Don’t see your favorite? Leave your pick in the comments for other hungry MLive.com readers. Southwest Detroit’s taquerias are the Mexican version of a coney island — informal diners with limited menus and cheap prices. While you can’t go wrong in any of the little restaurants along Bagley or Vernor, Lupita is the legend. We love the three dollar lunch special, though any glutton could stuff themselves at dinner for an Alexander Hamilton. Make sure to try the smooth, creamy avocado salsa before the al pastor (pork) tacos, authentically topped with onions and cilantro. No credit cards or alcohol. It’s common to rave over this hidden gem’s homemade pastas and hand-kneaded ravioli, but chef Norberto Garita’s Mexican menu is just as noteworthy as his fine Italian cuisine. Tacos, enchiladas and tortas all make an appearance — but why not taste Garita’s chile en nogada or his incomparable-in-Detroit mole poblano for the price of an entree at Chili’s? Every Detroiter worth their tequila-and-salt has a favorite Mexicantown eatery, and nearby Xochimilco’s usually wins most of the acclaim. But after sharing two dozen meals at Los Galanes, I’m prepared to call this restaurant the Best of Bagley’s alcohol-serving establishments. For adventurous eaters, it pays to stray from the Americanized Mexican menu. The cazuelas de mariscoes (seafood soup) bests recipes I’ve tried in restaurants charging twice the price. The customizable tortilla soup presentation rocks, as do the delicious goat fajitas, marinated and cooked as tender as pot roast. They also boast one of the prettiest outdoor patios in town. Chef/owner Brian Polcyn recreated his popular Five Lakes Grill as a Mexican restaurant that doesn’t abandon the finer-dining aspects of his cooking (see Birmingham’s Forest Grill). That means duck confit and pork belly tacos elbow more standard proteins out of the limelight. Sopes are two corn masa bowls filled with goodies like pork belly, roasted pork shoulder, black beans, cilantro and queso fresco. This isn’t Metro Detroit’s most authentic Mexican restaurant, but don’t try telling that to the patrons who’ve waited for a Friday night table for the last 20 years. The deep-fried titanico tacos are a delicious upgrade on the popular chalupa recipe; Lindo’s medium botana is arranged on fresh tortilla chips and comes heaped with fresh green vegetables. For less frills, try the nearby Taqueria San Jose on Elizabeth Lake Rd. Anthony Curis’ taco truck on wheels is the talk of the town. A new and improved menu offers us hungry diners tantalizing tastes of the south, with a decidedly grown-up twist. Deep-fried pork belly tacos? Check. A vegetarian burrito rolled with fried sweet potatoes, tangy slaw and black beans? Got that too. For a new taste, check out the D-town burrito at Jacques Tacos, filled to the brim with braised short ribs.